Disclaimer: This document was prepared in an earlier cycle. 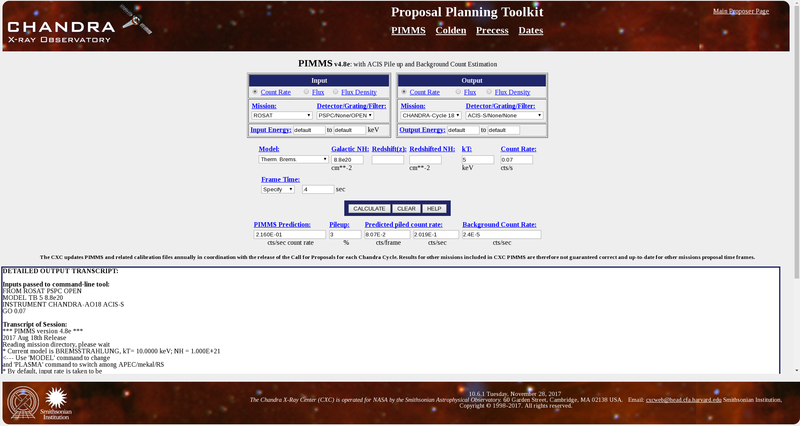 The ouput and results from proposal tools may differ if you attempt to follow the example. 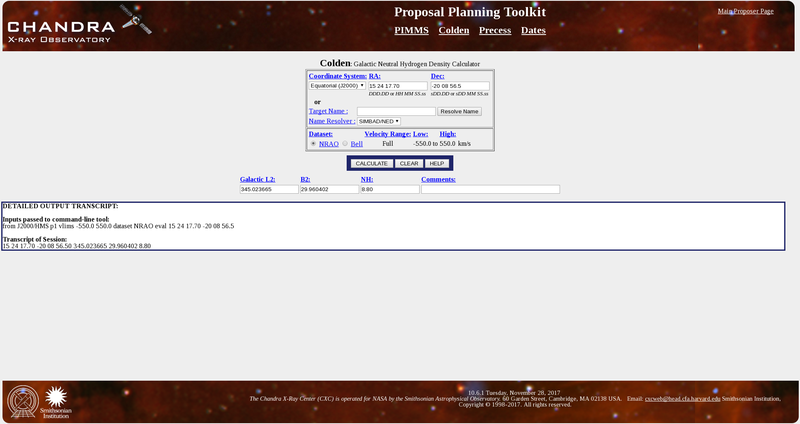 Always check the Call for Proposals and Proposers' Observatory Guide for current information, and be sure you are using the latest versions of software linked off the Proposer page when you prepare a proposal. Enter the RA and Dec of the object. The source 1RXS J152417.7-200856 is at RA: 15 24 17.70 and Dec: -20 08 56.5. Verify that these boxes are checked: Archived, Observed, Scheduled, and Unobserved. Pitch angle restrictions are described in detail in the POG. The pitch angle of a celestial source changes throughout the year. Therefore, the maximum exposure time might also change througout the Cycle. There may be times when it is impossible to schedule a particular target. Proposers who require time constraints should use the PRoVis tool to check that the constraints are feasible. 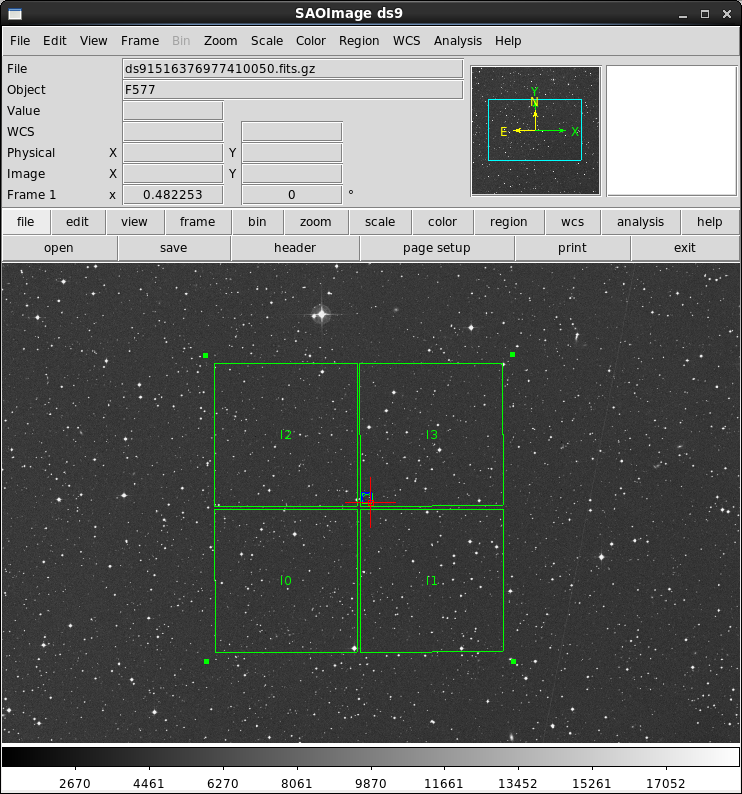 The exposure time for this target is very short and the observation is not time constrained. Therefore pitch angle restrictions are not important for this proposal. Click CALCULATE. Shown in Figure 6 are the PIMMS results for the Power Law model. 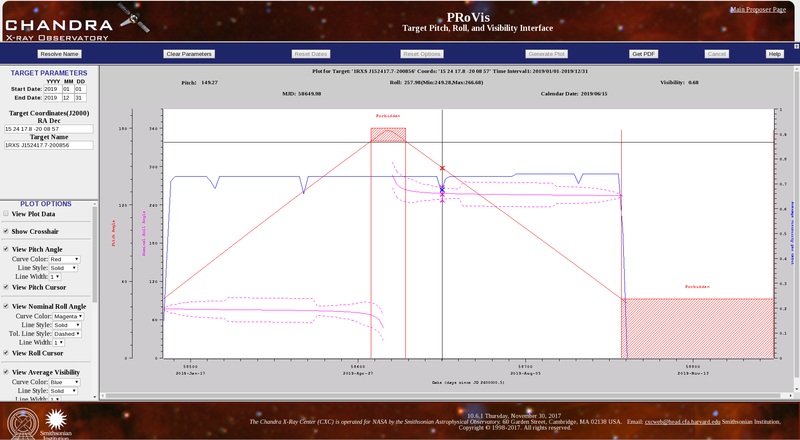 PIMMS predicts an ACIS-S count rate of 0.3265 cts/sec with 35% pileup. PIMMS also calculates a background count rate of 2.4e-5 cts/sec. For this model, PIMMS predicts an ACIS-S count rate of 0.2160 cts/sec with 24% pileup, and a background count rate of 2.4e-5 cts/sec. 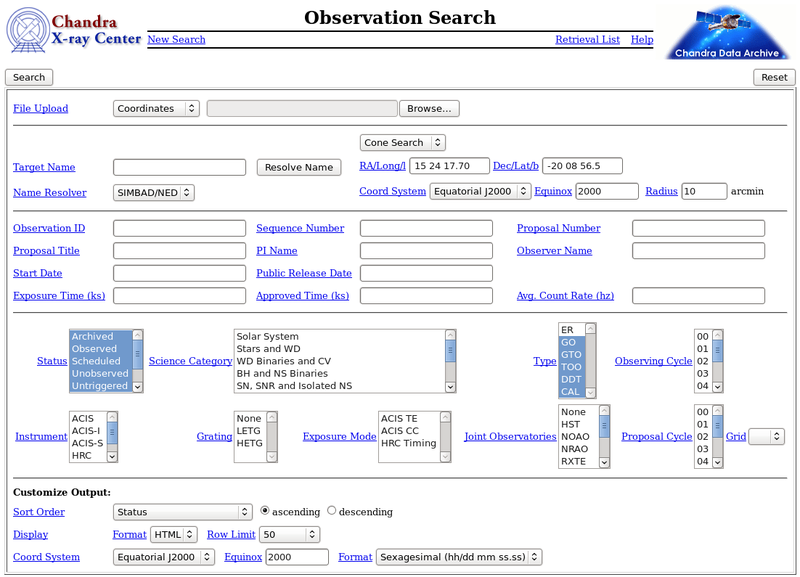 The minimum allowed requested exposure time for a Chandra observation is 1 ksec. This gives a total of 0.2160 cts/sec * 1000 sec = 216 counts. The corresponding signal-to-noise ratio is 216/sqrt(216) = 14.7. Background is ignored here since there are only 2.4e-5 cts/sec * 1000 sec = 0.0024 background photons within the point source region. With a total of 216 counts, it will be possible to get a rough spectral slope. If a spectrum is required, the total number of detected counts should be at least about 1000, which would increase the exposure time to 5 ksec. In calculating the total field count rate, we need to consider all contributions to the background. Estimates of the background as a function of energy band are provided in the ACIS total background section of the POG. Table 6.10 gives the total background rate for the S3 BI chip to be 10.0 counts/sec/chip, for the upper energy cutoff of 15 keV. Since we are using a 1/8 subarray, our total background rate is 1/8th of this count, or 1.25 counts/sec. Using the source count rate we calculated earlier, the total field count rate is 0.216 + 1.25 = 1.466 cts/sec. The total field count rate for our observation is 1.466 cts/sec. All of the ACIS telemetry formats would accomodate this count rate. Therefore, we select the Very Faint format for our observation, since this provides the most information about each event. The RPS proposal target form should have the following parameter values for this observation. If a parameter isn't listed here, for example, Y Detector Offset, use the default RPS value or leave the field blank.